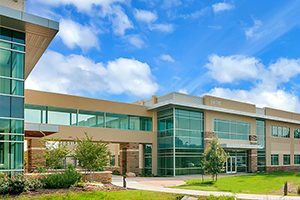 Austin, TX—October 6, 2014—The University of St. Augustine for Health Sciences (USA) celebrated the opening of a second building on its southwest Austin campus on Sept. 22. The two-story, 36,000-square-foot building is a substantial addition to USA’s existing facilities, housing classrooms, skills labs, an amphitheater with tiered seating, study areas, and a student lounge. “This new building will make our programs accessible to more students and help prepare them to enter or advance in high-demand careers as physical therapists, occupational therapists, and orthopaedic assistants,” said Dr. Wanda Nitsch, USA’s president and chief academic officer. The University of St. Augustine for Health Sciences (USA) is a graduate institution that emphasizes health science education through innovative quality classroom and distance education, and is a member of the Laureate International Universities network. Founded in 1979, USA has locations in San Marcos, California; St. Augustine, Florida; and Austin, Texas. The university is regionally accredited by the WASC Senior College and University Commission (WSCUC) and nationally accredited by the Distance Education Accrediting Commission (DEAC). USA’s physical therapy programs are accredited by the Commission on Accreditation in Physical Therapy Education (CAPTE), and its occupational therapy programs are accredited by the Accreditation Council for Occupational Therapy Education (ACOTE). Degree offerings include the Doctor of Physical Therapy (DPT), the Master of Occupational Therapy (MOT), the Dual Degree Option (MOT/DPT), the Master of Health Sciences in Athletic Training, the Flexible Doctor of Physical Therapy (DPT) and the Flexible Master of Occupational Therapy (MOT). USA also offers the Transitional Doctor of Occupational Therapy, the Transitional Doctor of Physical Therapy, the Doctor of Education (EdD), the Doctor of Health Science (DHSc), the Clinical Orthopaedic Residency, the Orthopaedic Manual Physical Therapy Fellowship program, and continuing education seminars and certifications for currently licensed therapists. For more information, visit www.usa.edu.